Martin Luther (; [ˈmaɐ̯tiːn ˈlʊtɐ]; 10 November 1483 – 18 February 1546), O.S.A., was a German professor of theology, composer, priest, monk and a seminal figure in the Protestant Reformation. Luther came to reject several teachings and practices of the Roman Catholic Church. He strongly disputed the Catholic view on indulgences as he understood it to be, that freedom from God's punishment for sin could be purchased with money. Luther proposed an academic discussion of the practice and efficacy of indulgences in his Ninety-five Theses of 1517. His refusal to renounce all of his writings at the demand of Pope Leo X in 1520 and the Holy Roman Emperor Charles V at the Diet of Worms in 1521 resulted in his excommunication by the Pope and condemnation as an outlaw by the Emperor. Luther taught that salvation and, consequently, eternal life are not earned by good deeds but are received only as the free gift of God's grace through the believer's faith in Jesus Christ as redeemer from sin. His theology challenged the authority and office of the Pope by teaching that the Bible is the only source of divinely revealed knowledge from God and opposed sacerdotalism by considering all baptized Christians to be a holy priesthood. Those who identify with these, and all of Luther's wider teachings, are called Lutherans, though Luther insisted on Christian or Evangelical as the only acceptable names for individuals who professed Christ. 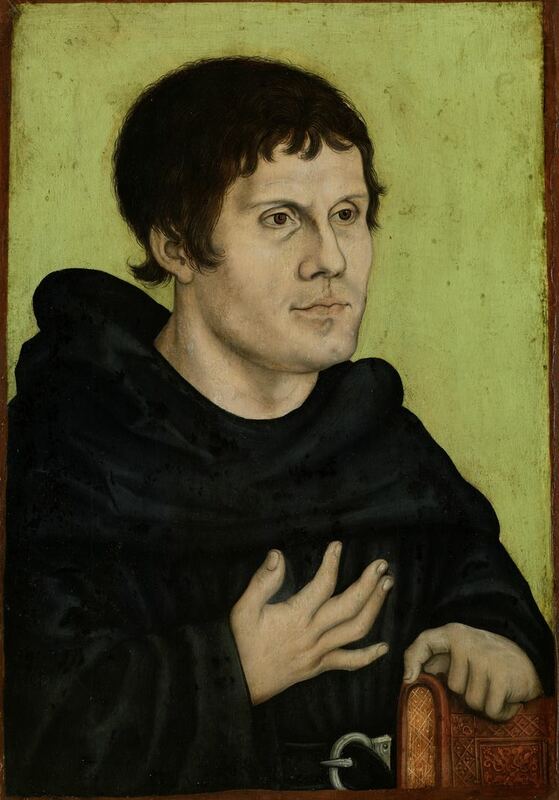 Martin Luther was born to Hans Luder (or Ludher, later Luther) and his wife Margarethe (née Lindemann) on 10 November 1483 in Eisleben, Saxony, then part of the Holy Roman Empire. He was baptized the next morning on the feast day of St. Martin of Tours. His family moved to Mansfeld in 1484, where his father was a leaseholder of copper mines and smelters and served as one of four citizen representatives on the local council. 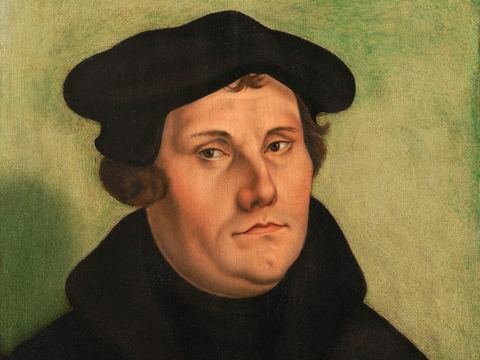 The religious scholar Martin Marty describes Luther's mother as a hard-working woman of "trading-class stock and middling means" and notes that Luther's enemies later wrongly described her as a whore and bath attendant. In 1501, at the age of 19, he entered the University of Erfurt, which he later described as a beerhouse and whorehouse. He was made to wake at four every morning for what has been described as "a day of rote learning and often wearying spiritual exercises." He received his master's degree in 1505. He later attributed his decision to an event: on 2 July 1505, he was returning to university on horseback after a trip home. During a thunderstorm, a lightning bolt struck near him. Later telling his father he was terrified of death and divine judgment, he cried out, "Help! Saint Anna, I will become a monk!" He came to view his cry for help as a vow he could never break. He left law school, sold his books, and entered St. Augustine's Monastery in Erfurt on 17 July 1505. One friend blamed the decision on Luther's sadness over the deaths of two friends. Luther himself seemed saddened by the move. Those who attended a farewell supper walked him to the door of the Black Cloister. "This day you see me, and then, not ever again," he said. His father was furious over what he saw as a waste of Luther's education. On 3 April 1507, Jerome Scultetus, Bishop of Brandenburg ordained Luther in Erfurt Cathedral. In 1508, von Staupitz, first dean of the newly founded University of Wittenberg, sent for Luther, to teach theology. He received a bachelor's degree in Biblical studies on 9 March 1508, and another bachelor's degree in the Sentences by Peter Lombard in 1509. In 1516, Johann Tetzel, a Dominican friar and papal commissioner for indulgences, was sent to Germany by the Roman Catholic Church to sell indulgences to raise money to rebuild St. Peter's Basilica in Rome. Tetzel's experiences as a preacher of indulgences, especially between 1503 and 1510, led to his appointment as general commissioner by Albert, archbishop of Mainz, who, deeply in debt to pay for a large accumulation of benefices, had to contribute a considerable sum toward the rebuilding of St. Peter's Basilica in Rome. Albrecht obtained permission from Pope Leo X to conduct the sale of a special plenary indulgence (i.e., remission of the temporal punishment of sin), half of the proceeds of which Albrecht was to claim to pay the fees of his benefices. On 31 October 1517, Luther wrote to his bishop, Albert of Mainz, protesting the sale of indulgences. He enclosed in his letter a copy of his "Disputation of Martin Luther on the Power and Efficacy of Indulgences", which came to be known as the Ninety-five Theses. Hans Hillerbrand writes that Luther had no intention of confronting the church, but saw his disputation as a scholarly objection to church practices, and the tone of the writing is accordingly "searching, rather than doctrinaire." Hillerbrand writes that there is nevertheless an undercurrent of challenge in several of the theses, particularly in Thesis 86, which asks: "Why does the pope, whose wealth today is greater than the wealth of the richest Crassus, build the basilica of St. Peter with the money of poor believers rather than with his own money?" However, this oft-quoted saying of Tetzel was by no means representative of contemporary Catholic teaching on indulgences, but rather a reflection of Tetzel's capacity to exaggerate. Yet, if Tetzel overstated the matter in regard to indulgences for the dead, his teaching on indulgences for the living was in line with Catholic dogma of the time. According to one account, Luther nailed his Ninety-five Theses to the door of All Saints' Church in Wittenberg on 31 October 1517. Scholars Walter Krämer, Götz Trenkler, Gerhard Ritter, and Gerhard Prause contend that the story of the posting on the door, even though it has settled as one of the pillars of history, has little foundation in truth. The story is based on comments made by Philipp Melanchthon, though it is thought that he was not in Wittenberg at the time. There, over a three-day period in October 1518, Luther defended himself under questioning by papal legate Cardinal Cajetan. The Pope's right to issue indulgences was at the centre of the dispute between the two men. The hearings degenerated into a shouting match. More than writing his theses, Luther's confrontation with the church cast him as an enemy of the pope. Cajetan's original instructions had been to arrest Luther if he failed to recant, but the legate desisted from doing so. Luther slipped out of the city at night, unbeknownst to Cajetan. Luther had published his German translation of the New Testament in 1522, and he and his collaborators completed the translation of the Old Testament in 1534, when the whole Bible was published. He continued to work on refining the translation until the end of his life. 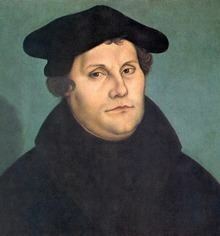 Others had translated the Bible into German, but Luther tailored his translation to his own doctrine. When he was criticised for inserting the word "alone" after "faith" in Romans 3:28, he replied in part: "[T]he text itself and the meaning of St. Paul urgently require and demand it. For in that very passage he is dealing with the main point of Christian doctrine, namely, that we are justified by faith in Christ without any works of the Law. ... But when works are so completely cut away – and that must mean that faith alone justifies – whoever would speak plainly and clearly about this cutting away of works will have to say, 'Faith alone justifies us, and not works'." Luther's 1524 creedal hymn "Wir glauben all an einen Gott" ("We All Believe in One True God") is a three-stanza confession of faith prefiguring Luther's 1529 three-part explanation of the Apostles' Creed in the Small Catechism. Luther's hymn, adapted and expanded from an earlier German creedal hymn, gained widespread use in vernacular Lutheran liturgies as early as 1525. Sixteenth-century Lutheran hymnals also included "Wir glauben all" among the catechetical hymns, although 18th-century hymnals tended to label the hymn as Trinitarian rather than catechetical, and 20th-century Lutherans rarely use the hymn because of the perceived difficulty of its tune. Luther wrote "Aus tiefer Not schrei ich zu dir" ("From depths of woe I cry to You") in 1523 as a hymnic version of Psalm 130 and sent it as a sample to encourage evangelical colleagues to write psalm-hymns for use in German worship. In a collaboration with Paul Speratus, this and seven other hymns were published in the Achtliederbuch, the first Lutheran hymnal. In 1524 Luther developed his original four-stanza psalm paraphrase into a five-stanza Reformation hymn that developed the theme of "grace alone" more fully. Because it expressed essential Reformation doctrine, this expanded version of "Aus tiefer Not" was designated as a regular component of several regional Lutheran liturgies and was widely used at funerals, including Luther's own. Along with Erhart Hegenwalt's hymnic version of Psalm 51, Luther's expanded hymn was also adopted for use with the fifth part of Luther's catechism, concerning confession. Luther was the most widely read author of his generation, and within Germany he acquired the status of a prophet. According to the prevailing view among historians, his anti-Jewish rhetoric contributed significantly to the development of antisemitism in Germany, and in the 1930s and 1940s provided an "ideal underpinning" for the Nazis' attacks on Jews. Reinhold Lewin writes that anybody who "wrote against the Jews for whatever reason believed he had the right to justify himself by triumphantly referring to Luther." According to Michael, just about every anti-Jewish book printed in the Third Reich contained references to and quotations from Luther. Heinrich Himmler (albeit never a Lutheran, having been brought up Catholic) wrote admiringly of his writings and sermons on the Jews in 1940. The city of Nuremberg presented a first edition of On the Jews and their Lies to Julius Streicher, editor of the Nazi newspaper Der Stürmer, on his birthday in 1937; the newspaper described it as the most radically anti-Semitic tract ever published. It was publicly exhibited in a glass case at the Nuremberg rallies and quoted in a 54-page explanation of the Aryan Law by Dr. E.H. Schulz and Dr. R. Frercks. Luther had been suffering from ill health for years, including Ménière's disease, vertigo, fainting, tinnitus, and a cataract in one eye. From 1531 to 1546 his health deteriorated further. The years of struggle with Rome, the antagonisms with and among his fellow reformers, and the scandal that ensued from the bigamy of the Philip I, Landgrave of Hesse incident, in which Luther had played a leading role, all may have contributed. In 1536, he began to suffer from kidney and bladder stones, arthritis, and an ear infection ruptured an ear drum. In December 1544, he began to feel the effects of angina. Reformation Day commemorates the publication of the Ninety Five Theses in 1517 by Martin Luther; it has been historically important in the following European entities. It is a civic holiday in the German states of Brandenburg, Mecklenburg-Vorpommern, Saxony, Saxony-Anhalt and Thuringia. Slovenia celebrates it due to the profound contribution of the Reformation to its culture. Austria allows Protestant children not to go to school that day, and Protestant workers have a right to leave work in order to participate in a church service. Switzerland celebrates the holiday on the first Sunday after 31 October. It is also celebrated elsewhere around the world. The American Edition (Luther's Works) is the most extensive English translation of Luther's writings, indicated either by the abbreviation "LW" or "AE". The first 55 volumes were published 1955-1986, and a twenty volume extension (vols. 56-75) is planned of which volumes 58, 60, and 68 have appeared thus far.